I am standing in the Puerta del Sol in Madrid, and I have that same look on my face. I feel somehow let down that this once busy but quaint plaza has come into the 21st century in a way I don’t entirely get. And I don’t yet understand how I feel about it. The Community College of Vermont is pleased to announce that the following students have been named to the President’s and Dean’s List. As the final Monday night classes of the semester kicked off this past week, students, staff, and faculty from around the College were given a crash course in Kingdom lore and literature from one of Vermont’s masters. How does one go about getting a check for a cool grand in the mail from CCV? Here’s a recipe: To start, contribute in class and keep your grades up. Next, spend a good amount of time helping your fellow students succeed. When asked for help, give freely. And finally, do lots of selfless acts to strengthen your community. Essentially, act like a leader and you’ll be rewarded as a leader. Mom’s shepherd’s pie, Indian curry, and bacon may not have a whole lot in common at first blush, but in Room 304 at CCV-Winooski, they’re connected. Sixteen adults from Chittenden County received certificates Monday night after completing a six-week court interpreting course at the Community College of Vermont’s Winooski center. The course was the third of its kind, funded by the Vermont Judiciary, but the first one held at CCV. The Community College of Vermont is pleased to announce that the following students have been named to the President’s and Dean’s List. To be named to the President’s List, full-time students must complete the semester with a 4.0 grade point average. To be named to the Dean’s list, full-time students must complete the semester with a grade point average between 3.5 and 3.99. 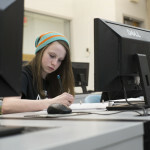 Community College of Vermont’s Assessment of Prior Learning (APL) course added another 13 students to its completion ranks on May 6, all of them Comcast employees. Identical twins Kaitlyn and Keilani Pellerin of Fair Haven are in agreement: Intro to College Studies is a lot of fun. The two Fair Haven Union High School sophomores, along with nine fellow students from the school, are spending their Wednesday evenings learning about communication, time management, college financial planning, and a bevy of other useful skills that will help them get into college and succeed once they’re there. And while they both say they’re enjoying the ICS subject matter, there are some other aspects of the course that’s got the Pellerins and their ICS classmates singing its praises. Former punk rock bassist. Comic book aficionado. Indie film enthusiast. CCV Middlebury, meet your 2013 student leadership scholar. Andolfo stands 6’ tall, he’s a got a lot of tattoos, and he carries himself with an enormous air of confidence. But give him your ear for 30 seconds and any preconceived notions you may have formed disappear, replaced by a sense of awe for an affable man whose humility is inspirational and whose enthusiasm for life is infectious.